17 | September | 2012 | Get Thet, Go!! Would you believe that there are only nine events left on the European Tour this term? Okay, there’s a little thing called the Ryder Cup in between now and the Alfred Dunhill Links Championship at St Andrews the first weekend of October (note to self – select Fantasy Race to Dubai Team before jetting off to Lanzarote on the 6th), but the season’s well and truly entering its final stages as we enter autumn officially on Saturday, when both daylight and nighttime last twelve hours apiece. Here’s a quick run-down of the remaining 2012 European Tour events, with all but the aforementioned trip to Scotland and the following week’s trip to Vilamoura for the Portuguese Masters taking place in the southern hemisphere. The guys and gals at the European Tour know how to get themselves out of the cool run up to winter, don’t they? In my article for Sports Monger on the Green this weekend, I alluded to the fact that RoMac had just about got everything wrapped up for the season. 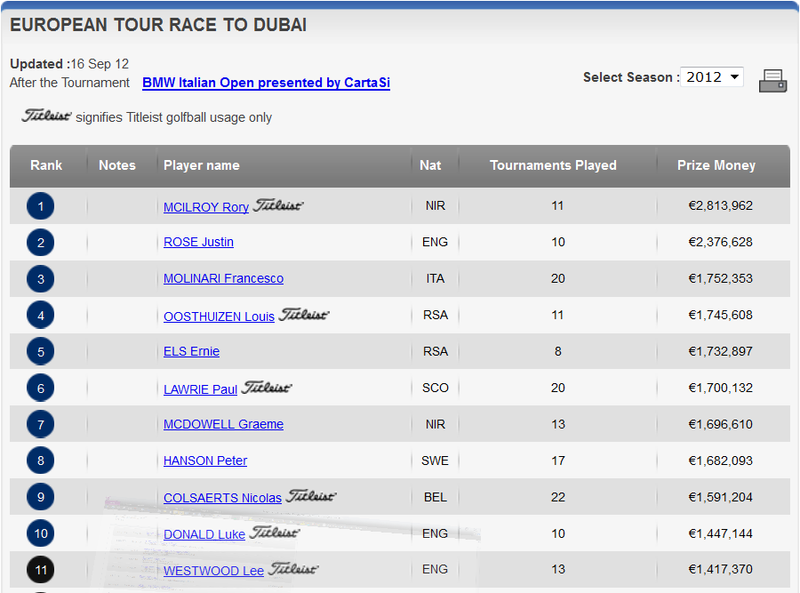 But if you look at the Race to Dubai rankings, below left, there’s still a Rose that could be a thorn in McIlroy’s side, Justin time for Dubai. If you’re taking recent form into consideration, you’d say that the Holywood man will go on to win the FedEx Cup and both money lists either side of The Atlantic. But Rose, who was Europe’s top home soil earner for the majority of the early part of the season, is only half a million Euro behind Rory. The money left on offer on the European Tour, worked out at today’s Dollar/Euro rate of $1.00/€0.69 where the purse is offered in dollar$, means that a couple of wins for Justin in the last nine events could see the lead swap again. Of course, swapping leads will be no alien concept for McIlroy, whose pass the parcel with Luke this season for the OWGR number one spot has been well documented. But Rose will at least want to finish the season on the same number of Tour events as Rory to put him on an even footing, having currently played ten to the Northern Irishman’s eleven, before they head to Dubai for the season’s showcase finale, where a whopping £8M is up for grabs in total. But the Alfred Dunhill’s three weeks away and there’s that small matter of Medinah CC in Illinois in a little over ten days time to get our heads around first before we start contemplating the OWGR, FedEx and Race to Dubai final standings. For that, at least, Luke, Rory and Justin will all be batting for the same team as Team Europe look to defend the Ryder Cup won so valiantly at Celtic Manor two autumns hence. Homeless families in B&B accommodation up by 44% | Society | The Guardian. I promised a bit of social commentary on this blog, but it’s been pretty much dominated by golf and soccer. This is the type of thing I mean by social commentary. For all of the suckers who fell for that smarmy git in the elections two years ago and for Nick Clegg who, once he leaves #10 will likely never get re-elected as a quiz team captain let alone as a serious political candidate: this is what the Tories do! They shaft the working class, line their own pockets first and then those of the captains of industry who got them there on the back of a promise that they would in turn be looked after once the blue flag was flying in Downing Street, again. Any thought of that blue turning just a little green with the Lib Dem‘s splash of yellow has long since been whitewashed as Cameron’s given Clegg what he wanted, knowing full well that it would never get through the House. How much more damage will Cameron and his silver-spoon cabinet cause before the UK’s the next European country to take arms and stage a modern-day version of the Peasant’s Revolt? This latest study by the National Housing Federation is another nail on a coffin-lid almost closed on Cameron and his cosseted cronies, showing just how many families are being forced into B&Bs because of Housing Benefit Capping under emergency temporary accommodation. On top of that, add a 25% increase in the number of households classed as homeless since we were Con-Dem-ed at the polls, now over fifty thousand, and the dawn of a second wave of Thatcherite Britain has not only penetrated the cloud on the eastern horizon but, before we know it, will be blinding us in the intensity of its midday heat. Nobody voted for a coalition; we want it even less. The Tories are using austerity as a weapon to crush the working man’s resolve, allowing foreign investors to buy homes in London, forcing the average price up making its historical residents homeless, sending them to Coventry, or just up the road to Stoke, and will let those investors living in the Capital plunder the vaults of the city of London and shift those monies back out of the UK before the Inland Revenue can say “income tax”. Let a working class bloke miss a penny payment in tax and he’s got a letter on the welcome mat the very next morning from the Inland Revenue demanding recompense. Cameron – your time is up. Do the honourable thing, step down and let the country vote on who it wants to see in the Cabinet and not let you, who lost eight points to Clegg on the live debates you were insistent upon, seat your university chums in a cosy orifice where the light from the real world no longer shines. “It felt like match play out there and I’m delighted to have come out on top,” – Fernandez-Castaño, upon winning the Italian Open at Royal Park I Roveri. Where I picked him frm this weekend, I don’t know, only that his name was screaming at me when I was choosing my Fantasy Race to Dubai Team, this week. On the same day that I had a reminder frm the European Tour about choosing my team, I had an e-mail from Ben at PaddyPower, asking me if I fancied a free bet on the Italian Open. Had I only the same conviction after I’d picked my team when Ben’s offer came through I could well have made myself a few bob from Gonzalo Fernandez-Castaño’s win. Always in hindsight, eh? Had I done my research and known that the 31-year old Spaniard had won here before, I may well have been even more tempted. With Simon Dyson winning a hat-trick of titles at the KLM this year, Lee Westwood retaining the Indonesian Masters and Luke Donald repeating his heroics at Wentworth in Spring, it’s been a year of golfers winning championships they’ve already got under their belt at some time in the past. Fernandez-Castaño left it until late to finally get the win by two shots after going into the weekend session having headed the leaderboard, but surrenedered it to valint runner up Garth Mulroy going into the final day. You can understand where Gonzalo was coming from when he made the match-play statement, with the lead passing between the final pairing all the way along the final eighteen holes. It was four consecutive birdies at the half way point that really put the Spaniard in the driving seat, but even then Mulroy fought back to level the score on the 70th hole of the competition weekend. Even though Nicolas Colsaerts had held the lead early in the day, he made heavy work of the back nine and it was a two horse race on the last two holes of the weekend that decided the 2012 Italian Open. With Gonzalo’s final score of -24 under for the tourney, you’d think that a par and a birdie on the last two may have jeopardised the Spaniard’s chances. However, it was the South African Mulroy who found trouble on both the 71st and 72nd holes that allowed those scores to be enough for Gonzalo to pick up his sixth Euroean tour title. Mulroy found the sandtraps on both of the last two holes, bogeying seventeen and parring eighteen, gifting Gonzalo the title by two clear shots. It was just the tonic Gonzalo needed after being pipped to Team Europe’s Ryder cup team by the aforementioned Colsaerts. Rather than arriving in Italy on his usual Tuesday to get acclimatised for a Tour event, Gonzalo stayed back a day to see his children start the new term at school. Perhaps this is a new beginning for Gonzalo, too. He’s spoken to Olly about not making the team for Medinah and fully understands why he’s not been included. He knows himself, his performances have not been polished and consistent enough throughout the season. It was that simple. But that was set aside in Italy as he took his first title since last November and, more importantly, scored Zeb’s Tee Totallers maximum points in the Fantasy Race to Dubai – Go, Go, Go, Gonzalo!